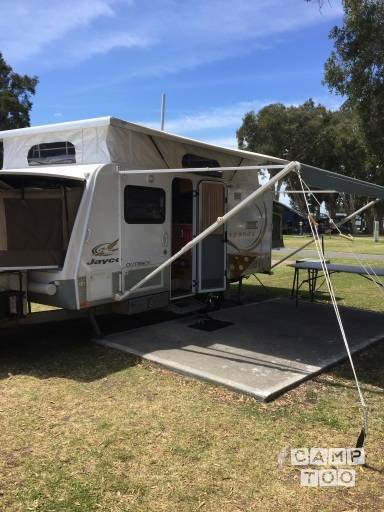 Comfortable Jayco Outback 8 berth caravan for hire in Redhead, NSW. Equipped with a toaster, kettle, cooking utensils, cutlery, BBQ, bike rack, outdoor hot shower, extra bed converts to a dining table, 3-way fridge, free camping with solar and battery power. Awning and extra fridge available. No smoking in Caravan or Annex. Gas supplied. Camp table supplied. Linen is required, mattress protectors are supplied. Caravan is to be returned in a clean and tidy manner. Please ring me if you have any questions. Enjoy your time away. Je kan de caravan ophalen in Redhead bij David And Amanda Illingworth.